A layman will no doubt find it hard to understand how pathological disorders of the body and mind can be eliminated by 'mere' words. He will feel that he is being asked to believe in magic. And he will not be so very wrong, for the words which we use in our everyday speech are nothing other than watered-down magic. But we shall have to follow a roundabout path in order to explain how science sets about restoring to words a part at least of their former magical power. Psychical (or Mental) Treatment (1905), In James Strachey (ed. ), The Standard Edition of the Complete Psychological Works of Sigmund Freud (1953), Vol. 7, 283. Affections, in Hippocrates, trans. P. Potter (1988), Vol. 5, 7. For scholars and laymen alike it is not philosophy but active experience in mathematics itself that can alone answer the question: What is mathematics? 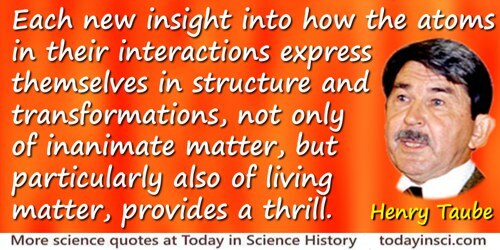 As co-author with Herbert Robbins, in What Is Mathematics? : An Elementary Approach to Ideas and Methods (1941, 1996), xiii. He who is unfamiliar with mathematics remains more or less a stranger to our time. In Die Mathematik die Fackelträgerin einer neuen Zeit (1889), 39. As translated in Robert Édouard Moritz, Memorabilia Mathematica; Or, The Philomath’s Quotation-book (1914), 122. From the original German, “Wer mathematisch ein Laie ist, geht mehr oder weniger als Fremder durch unsere Zeit”. 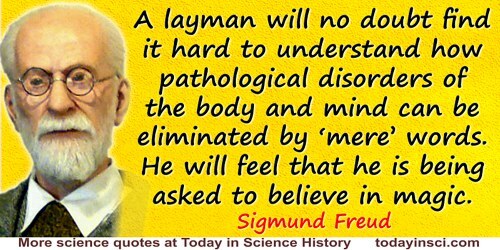 More literally, the first phrase would be translated as, “He who is a layman in mathematics…”. If we do discover a complete unified theory, it should be in time understandable in broad principle by everyone, not just a few scientists. Then we shall all, philosophers, scientists and just ordinary people, be able to take part in the discussion of why it is that we and the universe exist. If we find the answer to that, it would be the ultimate triumph of human reason—for then we would know the mind of God. A Brief History of Time (1988), 191. In scientific thought we adopt the simplest theory which will explain all the facts under consideration and enable us to predict new facts of the same kind. The catch in this criterion lies in the world “simplest.” It is really an aesthetic canon such as we find implicit in our criticisms of poetry or painting. The layman finds such a law as dx/dt = κ(d²x/dy²) much less simple than “it oozes,” of which it is the mathematical statement. The physicist reverses this judgment, and his statement is certainly the more fruitful of the two, so far as prediction is concerned. It is, however, a statement about something very unfamiliar to the plain man, namely the rate of change of a rate of change. In 'Science and Theology as Art-Forms', Possible Worlds (1927), 227. The layman is delighted to learn that after all, in spite of science being so impossibly difficult to understand, Scientists Are Human! In What Mad Pursuit (1988), 83. The terminology of the layman is an absence of terminology; the precision of the layman is an accuracy of impression rather than an accuracy of specific fact. As quoted in Brooks Jackson and Kathleen Hall Jamieson, unSpun: Finding Facts in a World of Disinformation (2007), 70-71.